It was precisely what our Agent feared: The "new player", Thomas Baseoliouse, had tracked in the dirt of his theme park attitude from another video game. EVE was under siege. Our Agents are known for their artful segues. They can steer a conversation toward the Code or MinerBumping like nobody's business. This was an emergency, so Kalorned went straight for the URL. And he still managed a smooth transition! The theme-park-ism was deeply ingrained in this miner. Like a World of Warcraft player who marvels at the graphics and user interface, he only looked at the surface of MinerBumping. He cared little for its content. Imagine if people judged EVE that way! In a few breezy lines, Thomas dismissed literally hundreds of MinerBumping posts. Not to mention the Code page. Kalorned was floored. The gulf between the two was staggering. 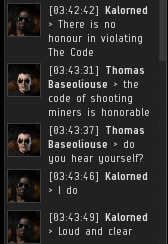 And yet, Kalorned's mission remained the same: No miner left behind. He would reach this carebear. The greatest challenge you'll ever face in EVE is trying to teach a carebear who doesn't want to be taught. Thomas resisted. Some learn best by hearing, others by seeing and reading, still others by doing. Kalorned tried every trick in the book to get Thomas interested in the Code. Nothing seemed to work. At times, it seemed the young miner was actually moving backward. Once again, he began to view the New Order through the prism of money, since money is the only thing a carebear ever thinks about. He totally forgot that no one makes a profit by killing Ventures. Kalorned introduced Thomas to the world of emergent gameplay. EVE was so much more than an isk-collection "game" for AFK'ers. There were greater, higher purposes available for those who would take them on. The more Thomas learned about the New Order and its Code, the more he was repulsed by it. When he saw the list of shareholders, he was disgusted. He'd assumed Kalorned was the only Agent. 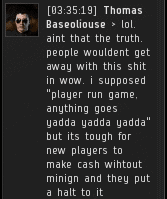 Now he felt the entire EVE community was rotten to its core. 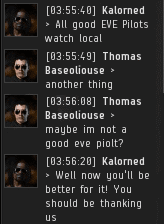 Because highsec wasn't 100% safe. Though Thomas was unwilling to purchase a permit and pledge loyalty to me on this occasion, Kalorned saw hope in the carebear's future. It was just a glimmer--so fleeting you'd almost miss it--but it was there. You know, it's easy to look at the bot-aspirant savages and write them all off as trash. Most EVE players do. They see highsec carebears as filth, scum, not worth saving. The New Order knows better. 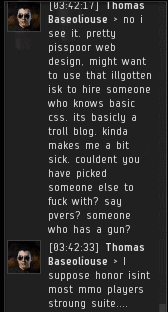 We care about everyone in highsec, no matter how worthless and pathetic they might seem to the untrained eye (or even the highly-trained eye). Because we see the same glimmer that Kalorned saw in Thomas. We have hope. And as a result, highsec has a future today. I think Thomas can still find faith in the Code through a bonus round. He's clearly willing to engage in long conversation, even if he's not quite there yet. Does Friday or Saturday night work? He reminds me a lot of Yodaknows. I don't think it's just me; have you noticed the desperation in the tone of the Carebears featured here lately? It's as if they can no longer ignore the steady march of New Order dominance in Highsec. They resist, but, as Thomas demonstrates, above, they get all tangled up when they realise that there is no counter to The Code. Kalorned, Knight, and your brave Wingmen, I salute you! If the carebears/white knights wanted to stop us, they should have done so 2 years ago while the New Order was still small and vulnerable. Today, the New Order is well-organized, well-funded and (most importantly) well-staffed. Whatever it is they plan to do, it'll be too little, way too late. The code always wins \o/. I was really hoping for a better outcome in part two, but I just saw more sjw meme spouting. I thank my lucky Eve universe stars that the Code has laid a beacon of sanity for rational pilots to flock to. This Thomas character reminds me of the type of people that comment on news sites. All vitriol and no awareness. People are quick to chastise the Code but I have yet to see an agent act with less than the utmost diligence and concern while communicating in a reasonable manner while on enforcement. The same can almost never be said about the carebears, always thinking there is someone else to blame besides themselves. Yeah right. 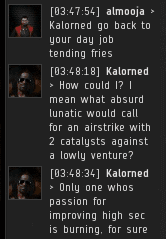 A "beacon of sanity" in which you attack people who are no threat to you and relive them of their hard earned isk and possessions. The NO is nothing more than a group of pirates and griefers who inflict harm on the highsec community. Yeah, I know, I'm not even going to bother to try. Thats right BM you don't bother to try, that's why you are comfortable with accomplishing nothing besides posting in the comments. to quote the Borg "resistance is futile"
It's a (more or less) wide-open space operations game where you can be a lot of things including, yes, "the villain". Gamers are playing the game as CCP has advertised, promoted, and (presumably from that) intended. then why are people crying so long and hard about it? 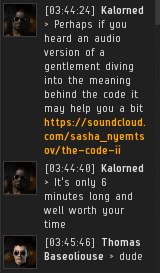 You're a true servant of the code Kalorned, salute! I love these "u r harmfl to community" tears, probably because the notion is so obviously absurd! EVE was so much more than an isk-collection "game" for AFK'ers. There were greater, higher purposes available for those who would take them on. woow james you almost make it sound like we have a choice not to listen to you, and have it our own way. Once again, another story demonstrating Code agents often spend real, quality time with even those who are initially hostile. Greater love hath no capsuleer than this, that a Code agent lay down his work to turn enemy into friend. The Code is love.